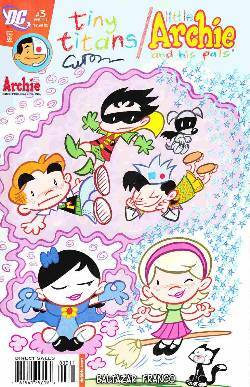 The crossover event of the millennium takes a turn for the magical as Sabrina the Witch and Raven take center stage, causing everything in the world of the Tiny Titans and Little Archie to get mixed up more than ever! And Veronica finally brings the other little kid with an 'R' on his shirt home to meet her father. Can Robin's utility belt help him in this kind of situation? And who is responsible for that mess in the Batcave? Archie can't blame the penguins this time! Join us for the Earth-shaking conclusion to this climactic event! Aw yeah, epic!